Sam Keogh's major new commission Terrestris is an exercise in excavation. Sealed in the seemingly infinite darkness of Project Arts Centre’s largest theatre space, Keogh's installation focuses on clusters of small, carefully lit sculptures and plinths each apparently mined from an unlit, hulking, monumental form in the centre of the space. 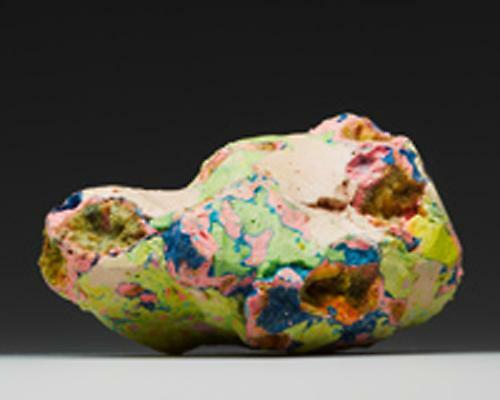 Simultaneously repulsive and attractive, Keogh’s forms are reminiscent of minerals, crystals or rock samples, but their toxic colouration and obviously artificial constituents speak of the stuff that the earth cannot digest, rather than anything produced naturally. The shared provenance of Terrestris and the contingency of its status (its reliance on context, belief, ideology or market value) claims a radical democratization of material. From this base level of equality, Terrestris claims its agency-as-matter. The Cube will be home to a trio of artworks, light, sound and video installations by Janice Kerbel (CA/UK), Zbynek Baladrán (CZ) and the 2010 Turner Prize winning artist Susan Philipsz (UK); and in the gallery the final piece of the exhibition will be a collection of playful sculptures as the works of Daniel Dewar & Grégory Gicquel (FR), Angela Fulcher (UK/IE) and Ruth E. Lyons (IE) play out side by side. Conjuring for Beginners runs at Project Arts Centre from 3 July until 11 August 2012, admission is free and the exhibition will be accompanied by a series of talks and special events. Spaces will be issued on a first come first served basis. The talk will be approx. 45 mins long and followed by tea and coffee.